A brief history of Washington’s economy. O ne of the last undiscovered frontiers in the United States, Washington State came of age relatively late in America’s history. Where the East Coast and Midwest had already been settled for a hundred years or more, settlers didn’t arrive in Washington until the mid- to late-1800s. Even then, it took another 20 to 30 years before the transcontinental railroad arrived, and with it industrialization and prosperity to what was then known as the Washington Territory. Being late to the party had its advantages. Some East Coast cities struggled to accommodate new ideas brought on by the Industrial Revolution such as electricity and horseless carriages. But Washington’s cities accommodated them with relative ease. Any hurdles in civic planning came from the challenging geography, not the technological advances of the time. The dense forests, bountiful fish runs and rich coal reserves used to power the Industrial Revolution gave the state’s economy a boost virtually overnight. The Alaska Gold Rush added further fuel to the economic fire as gold fever swept down from the Yukon and into the increasingly crowded cities along the West Coast that supplied the miners. Rapid growth did not come without a price. As lumberjacks and mill workers tried to keep up with demand, workplace safety became a heated issue and in response, workers formed the first unions to guarantee workers an eight-hour workday and worker’s compensation for job-related injuries. Within one person’s lifetime, Washington had gone from an ancient Native American fishing and hunting ground to groundbreaking political and social experiments and an unrivaled period of innovation and invention, from the mighty dams that harnessed the raw power of the Columbia River to the taming of the atom to bring an end to world war. It’s during this period that Washington’s unique pioneer spirit evolved. Early settlers had no choice but to fend for themselves and learn to live off the land. Shipments of goods from the eastern seaboard were at the mercy of fickle winds and unforgiving seas, taking months to arrive. Facing the uncertainty and inconvenience of daily life was not for everyone. It took grit and perseverance to turn adversity into opportunity and opportunity into progress. The separation of cultures and ethnicities that was common in other parts of the U.S. was not common in Washington towns. The rough and tumble existence of life in these parts required settlers to depend on one another to survive. The common ground became the work to be done and your neighbors were judged by their work ethic, not their ethnicity. Men, women and children came from all walks of life to seek adventure and prosperity in Washington State. In the small coal town of Roslyn, a town of just 700 residents, 24 nationalities were represented in its one-room schoolhouse. As with other parts of the country, Washington’s fortunes rose and fell with the nation’s economy. During World War I, area shipyards turned out a quarter of all ships built during the war. When the Great Depression hit, residents stood in soup lines and lived in shantytowns. Oil replaced coal, closing many of the mines. Lumber continued to provide some stability, but it took a second world war to bring the region back to life. During World War II, thousands of workers arrived to build bombers, tanks and other weapons of war. 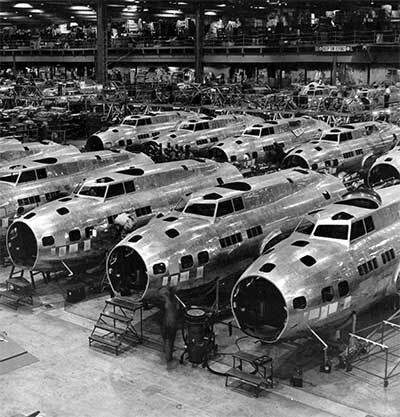 At its peak, Boeing’s Seattle plant turned out five B-17 bombers a day as everyone pitched in to win the war. In the Cascade Mountains, lumberjacks felled giant, old-growth fir trees to mill into lumber for airplanes, ships and barracks. In Eastern Washington, workers developed the plutonium used for the Manhattan Project in complete secrecy, transforming the sleepy farm communities of Kennewick, Pasco and Richland – the Tri Cities – into major population centers overnight. After WW II ended, Washington’s economy managed to shift from wartime production to peacetime. Where the economies of Idaho and Oregon were based on harvesting natural resources – which weren’t needed in such great quantities after the war – Washington’s economy benefitted from Cold War military contracts for new generations of aircraft and ships and the growing importance of strategically placed military bases. Even with Boeing as the region’s largest employer, Washington State hardly made a blip on the national scene. When someone mentioned Washington, the nation’s capital, not the state, most often came to mind. It wasn’t until civic planners secured a world’s fair in 1962 that the world began to take notice. 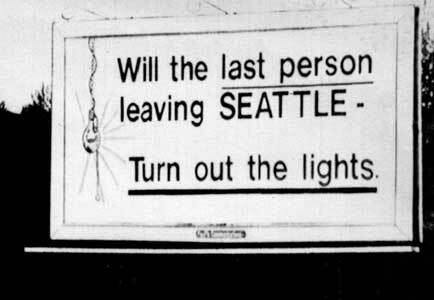 Dozens of countries came to Seattle to exhibit at the Century 21 Exposition. The fair not only attracted an international audience but lots of media attention. The fair’s iconic Space Needle appeared in thousands of newspapers and on the covers of dozens of magazines around the globe. Even Elvis Presley stopped by to make a movie about the world’s fair. It was a hard lesson to learn indeed, leaning too heavily on a single economic engine. In the intervening years, the state became more diligent in its quest to create a more diversified economy, one founded on emerging technology sectors. Thanks to the aerospace industry, Washington had a higher percentage of engineers and technology workers than other states, attracting new ideas and enterprises. This included bold startups in the nascent information and communication technology industry, pioneers like McCaw Cellular, Aldus, Microsoft and Cray. In Eastern Washington, traditional crops such as apples and cherries began to share the fertile land with grapes and hops. Sales of wine and beer made with premium Washington ingredients began to take off, as did new food manufacturing enterprises. Inexpensive power and plenty of water also gave rise to a new type of farm in Eastern Washington – the data farm – in communities that once relied solely on agriculture for economic growth. Indeed, Washington continues to reinvent itself on multiple fronts as a modern Innovation Economy. Thanks to efforts to expand broadband connectivity statewide, rural communities are beginning to become havens for technology-based startups, from gaming and mobile apps to big data. Urban cores in major cities are enjoying a renaissance, attracting younger workers and families who enjoy the convenience of living and working in energetic downtowns. Local business legends such as Amazon, Costco, Paccar, Nordstrom and Starbucks are being joined by other companies that want to leverage Washington’s pioneer spirit and reputation for amazing ideas, including Facebook, SpaceX, Twitter, Google and Apple. As a result, exciting new opportunities are coming online. Commercial space, composites, medical devices, artificial intelligence, augmented and virtual reality and robotics are creating new jobs and new industries around the state, built with that same resilience, perseverance and pioneer spirit that has gained Washington its international reputation for innovation and invention.